Creality CR-10 Ball bearings filament roll support by Greg191134 is licensed under the Creative Commons - Attribution license. This is a filament spool support for the CR-10 that complements the stock one. It uses ball bearings and has 2 lateral guides. This is definitely not a must have upgrade for the CR-10. You can consider it only if you had a print ruined by a spool problem. The aim was to secure prints that last very long by limiting the risk that something goes wrong due to the filament spool. The filament spool rolls on the ball bearings. The force required from the extruder to pull the filament is minimum and the movement is very smooth. 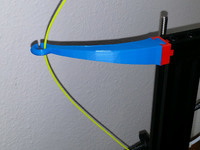 The two lateral guides are there to prevent the filament spool to shift or tangle on the axis. 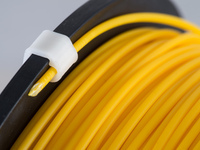 The system is designed for spools with a hole of dia 52mm or above. The bearing used have an internal diameter of 5mm, an external diameter of 16mm and a thickness of 5mm (625 type). You need 4 of them. 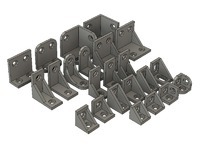 To have the complete set, you need to print 4 "Bearing support" and 2 "Lateral guide". Take 2 bearing supports, install one bearing on each, put them together and clip the assembly on the original spool holder axis. Do that twice to have the two support. You should be able to slide the supports to adjust their location. The lateral guides are installed as shown on the picture. If your axis has the same diameter as mine (30.3 mm), they will be really tight. This was on purpose. This idea is that you sand the inside of the hole so that you can move them on the axis but there is still a significant friction that prevent them to slide. Use the stock nut to secure everything (but be careful not block the rotation of the spool with the lateral guides).